Collecting objects that would normally be thrown away and converting them into art, has long been a favourite technique of many artists. This practice is now much more widespread, and with the growing awareness of the urgent need to reduce, reuse and recycle, art from recycled goods now has a more politicized nature to it. It is often used to campaign for the conservation of resources, that underpins the whole call for recycling. From the long running children's TV show 'Blue Peter', that taught us how to make spaceships and cybernauts from our mothers discarded kitchen roll tube, to the stark message of writer Ted Hughes' book 'The Iron Man', where a creature is assembled from waste metals and scrap materials, the message has been drilled home to most of us of the sixties generation: be creative, but change our wasteful habits. Cork animal sculptures, including a wonderful cork and driftwood horse, made by artist Heather Jansch, on display at the Eden Project, Cornwall. 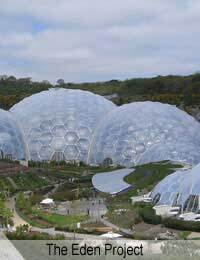 The Eden Project is a great resource for education about recycling, composting, and the ecological life of the planet in general. Worth the trip! A teapot made from tea bag wrappers, by the artist Donna Rhae Marder. A dress made from plastic tape and garbage bags, by artist Katherine Cobey. Famous American artist, Alexander Calder, made several of his well-known hanging mobiles from old coffee cans. Plastic bags are a favourite with many artists and designers – bracelets, lampshades; even dresses are increasingly common nowadays. Supermarket bags are such a pervasive threat to the environment, not degrading for approximately a 100 years, that the more we work with them to reuse their potential, as a material, the better. A house in Paper Cove, Boston, is made entirely of newspapers – just to prove it can be done!Elias Stenman began the project in 1922 which lasted 22 years, and used 215 layers of newspapers. Ingrid Goldbloom Bloch has made a whole series of wearable undergarments, entitled 'Trashy Lingerie', out of soft drink can strips, and Diane Savona has a dress called 'Domestic Armour' fashioned from oven mitts and pot holders – a statement against domesticity if ever there was! It’s wonderful to experience how much fun it is to create art and objects from everyday waste. Start by taking a class at your local college or community centre, perhaps in paper-making, or a general craft-making session, or buy a readily available book that teaches you how to do it. The only problem is, you'll need to create lots of space for all the waste you would usually throw away – by keeping it in order to make things with it, you'll soon realise just how much gets chucked out on a daily basis. But by going ahead and being creative with your waste – cardboard, plastic bags, packaging, materials, or paper perhaps, you'll be making something beautiful and educational to show off and get everyone you know recycling creatively too!